This Lateral Rotation Mattress system incorporates turningl rotation therapy to off load pressure and to facilitate pulmonary drainage. The “on demand” feature adds the low air loss function will provide a cool and dry surface for prevention and treatment of stage 4 pressure ulcers. The user friendly high flow control unit offers 10 comfort levels that allow the patient to sleep comfortably. The continuous feedback sensor technology of the control unit will equalize pressure and maximize patient comfort. This feature makes sure adequate pressure and air flow is evenly distributed through the mattress compensating for heavier areas such as the hips and shoulders. The 10, 20, 30 & 60 minute adjustable turning cycles are designed for pain management and assist in pulmonary blood flow and mucosal drainage. The (2) side bolsters provide the patient with optimal comfort while creating a safe environment during rotation. The mattress is constructed of (20) 8” high split-air cells that adjust the turning positions to 1/4, 1/2, 3/4 ,and full position turning up to a 40 degree angle. The medical grade foam base is 2" thick and protects the patent from bottoming out in the event of low pressure or a power outage. The pump is user friendly and includes hospital features such as lock out to prevent setting tampering, Audible and visual low pressure alarms, and a CPR feature for rapid deflation. This advanced lateral rotation mattress system is the ultimate in healing for stage 4 bed sores and advanced pressure relief. This mattress system is used in hospitals, nursing homes and home health care. 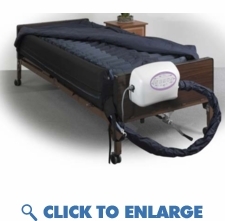 Fits over a standard medical bed frame or a twin sized box spring. This Lateral Rotation Mattress system incorporates turningl rotation therapy to off load pressure and to facilitate pulmonary drainage. The “on demand” feature adds the low air loss function will provide a cool and dry surface for prevention and treatment of stage 4 pressure ulcers. The user friendly high flow control unit offers 10 comfort levels that allow the patient to sleep comfortably. The continuous feedback sensor technology of the control unit will equalize pressure and maximize patient comfort. This feature makes sure adequate pressure and air flow is evenly distributed through the mattress compensating for heavier areas such as the hips and shoulders. The 10, 20, 30 & 60 minute adjustable turning cycles are designed for pain management and assist in pulmonary blood flow and mucosal drainage. The (2) side bolsters provide the patient with optimal comfort while creating a safe environment during rotation. The mattress is constructed of (20) 8” high split-air cells that adjust the turning positions to 1/4, 1/2, 3/4 ,and full position turning up to a 40 degree angle. The medical grade foam base is 2" thick and protects the patent from bottoming out in the event of low pressure or a power outage. The pump is user friendly and includes hospital features such as lock out to prevent setting tampering, Audible and visual low pressure alarms, and a CPR feature for rapid deflation. This advanced lateral rotation mattress system is the ultimate in healing for stage 4 bed sores and advanced pressure relief. This mattress system is used in hospitals, nursing homes and home health care. Fits over a standard medical bed frame or a twin sized box spring. Mattress Dimensions 80" x 36" x 10"